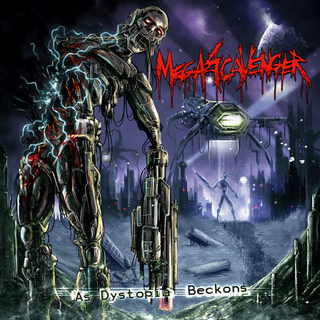 MEGASCAVENGER are known for having big names guesting on their albums and the latest one is no different. Their new album, ?As Dystopia Beckons?, released on Selfmadegod Records, again features a star-studded line up with band members of HAIL OF BULLETS, ex-MASSACRE, ex-MANTAS, ex-BENEDICTION, ex-BOLT THROWER, ECHELON, FLESHCRAWL, ENTRAILS, SINISTER, CRYPTICUS and others playing an important role in forming the sound of this band. Unlike ever before, Rogga Johansson, who is helming this project with authority and confidence, uses industrial sounds to lend to this album a futuristic, bold image that few bands dare to go for. While most stick to the tried-and-tested sound of bands like BOLT THROWER, ASPHYX, GRAVE, DISMEMBER, Rogga here is able to successfully meld the powerful and mighty death metal sound with the futuristic industrial touches reminiscent of bands like GODFLESH, PITCHSHIFTER, THE BERZERKER, OVERFLASH, MISERY LOVES CO., and even STRAPPING YOUNG LAD. The result is jaw-dropping old school death metal metamorphosed into something that retains the right elements while taking a huge step forward - this could very well mean a quantum leap for the whole state of death metal, and will definitely go down in history as a very important and significant release. Albums like these don't come out often and the scale here is pretty much unmatched. A must have.